In just under two weeks I'll be rolling into DC. I can't believe that six weeks have passed so quickly. What an amazing trip! The Congressional Union had time to plan a big reception for the envoys' arrival in DC. 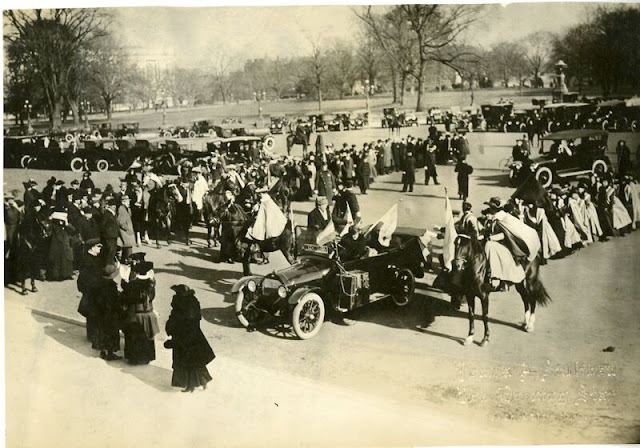 There was a parade of women in cars and on horseback down Pennsylvania Avenue, and something like 100 Congressmen met them on the steps of the Capitol. Later in the day they met with President Wilson. Though it won't be quite so grand we're also planning an event in the Canon House Office Building on November 17 to commemorate their trip and mine. Many thanks to Maine's Congresswoman Chellie Pingree for making that possible. I'll be joined there by four descendants of Sara Bard Field, all amazing activists in their own right. They are Sara Wood Smith, Laura Smith, Cynthia Matthews, and Eliza Livingston. If you're interested in attending the celebration please contact Sara Wood Smith at sarawsmith@gmail.com. is behind the wheel and Ingeborg is standing n the running board.